A THIRD OF THE WAY TO DELHI. One year ago today was our twelfth day in the saddle on our 2,000-mile bicycle trek through India. We reached the one-third point in our journey. With untrained Indian riders as our companions, our pace was slower and we were spending more time on our bikes each day than expected. But, all in all, we were pleased with our progress toward Umri Christian Hospital near Yavatmal and, ultimately, to New Delhi. SHARE THE ROAD. Some local folk referred to Indian roads as "the zoo." Seriously, we saw enough variety of animals on, beside or near National Highway 7 to populate a small zoo. Motorized vehicles and bicycles share the road with oxcarts and pony-drawn carriages, with goat and sheep herders, with all kinds of cows and water buffalo. Alongside the roads, one frequently saw chickens, pigs, monkeys, and a variety of unfamiliar birds. Strangely, all this seemed normal to us after only a few days. ROAD OF LIFE. Why NOT use this main north-south roadway to move India’s dynamic life along? 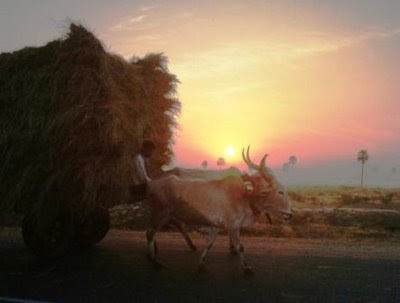 Unlike an American Interstate highway which prohibits bicycles and pedestrians, India's main artery is used by every sort of vehicle, animal, and human for transport. Fast-moving trucks and cars have to swerve, slow down, or stop for a herd of goats or camels. Sacred cows meander untethered and are affectionately called RTO's - "road traffic officers."